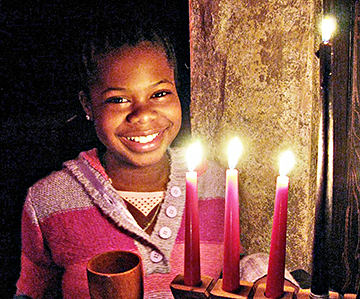 CELEBRATION OF LIGHT: Princeton Latin Academy student Maryam Muhammad lending the light of a smile and a candle to the Saturnalia celebration jointly held by the Latin Academy and the Princeton Science Academy. The music of the holidays was combined with the students&apos; recitations in Latin, Greek, and English; choruses; and symbolic skits. Besides the lighting of candles, there were readings for the various religions represented (some in multiple languages), Islam, Judaism, and Christianity; the celebration of Kwaanza was also recognized. Discussions about the rehabilitation of Harrison Street Park have been ongoing, and have involved members of Borough Council and staff; neighbors, including the group Harrison Street Park Friends; and Edgewater Design LLC, a Millburn-based firm. The Princeton Environmental Commission met last Wednesday to determine a spending plan for the remainder of the 2008 budget, discuss the budget for the upcoming year, and hear reports for Mountain Lakes Preserve and Marquand Park. While many residents have probably chanced upon Princeton Community Television while flipping through the channels, most dont know that they can work on their own shows on site at the station, or take classes there to gain video-making expertise. At its monthly meeting last week, the Princeton Public Library Board of Trustees approved a six-month trial of an outdoor Redbox, a $1-a-night DVD dispensing machine that would be located near the driveway at the rear of the library. The only other Redbox site in Princeton right now is at McCaffreys supermarket, with others nearby at the Skillman and Route One Shoprites, Wegmans, and the Princeton Junction Acme. Lester Arstark used to limit his antiques-loving wife Janices expeditions. Three antique shops all the way to Maine! she exclaimed recently, describing his impatience with her passion. Then, in the late 1970s, he caught the bug himself. The result is the extraordinary collection of antique toys that now lines the shelves of Mr. Arstarks office in their Windrows home. It was the opening goal of a routine mid-November regular season game at Union but it provoked one of the more heartfelt cheers seen in years from the members of the Princeton University mens hockey team. When Chris Ayres took over the Princeton University wrestling program in 2006, he was giving up a plum position. After enduring a 4-17 season last winter, the Princeton High boys hockey team was shooting to reach the .500 benchmark when it faced Hamilton last Thursday at Mercer County Park. Do we ever really outgrow Christmas? As long as kids and Christmas trees and songs old and new are around, it’s hard not to feel flashes of the old childhood fever, most of all on Christmas Eve. “The Night Before Christmas” is the first poem I knew by heart, but those weren’t “visions of sugarplums” dancing in my head. The Christmas Eve excitement was never that specific. What made the night special was something like the undefined mass of anticipation and wonderment Kate Bush has in mind when she sings “Don’t let the mystery go” in her Christmas song from 1980, “December Will Be Magic Again.” For me, it’s not a problem; the mystery may be more subtle now than it was when I was nine, but it’s still there, whether I’m listening to Berlioz’s L’Enfance du Christ or to imperfectly sung versions of “Silent Night” or reading A Christmas Carol or watching either the 1938 or the 1951 movie version.